Laser microscopy is a class of techniques for generating microscopic images. In most cases, one uses laser scanning of some sample with a diffraction-limited laser beam. Scanning may be achieved by moving either the laser beam or the sample. Light carrying information on the sample may be generated in different ways, for example by scattering, through polarization changes, by second harmonic generation or by exciting fluorescence (→ fluorescence microscopy). The intensity of that light coming from the object is recorded for each point in the sample . From these data, images can be produced on a computer, and of course they can be stored in electronic form. Numerical methods can be applied to process the images, e.g. to enhance the contrast. 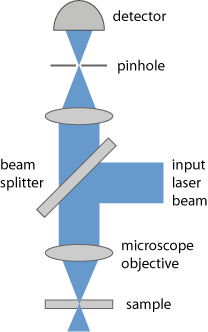 Figure 1: Setup of a confocal laser microscope. A frequently used imaging technique is based on a confocal geometry (→ confocal scanning microscopes), where the light from the focus in the sample is imaged (e.g. with a microscope objective) onto a pinhole, behind which the optical power is detected. This geometry suppresses the influence of light coming from other regions in the sample, e.g. from before or after the focus, because such light can not efficiently pass through the pinhole. In effect, mainly the depth resolution is improved. The confocal principle is emphasized in the term confocal laser scanning microscopy, and discussed in more detail in the article on confocal scanning microscopes. 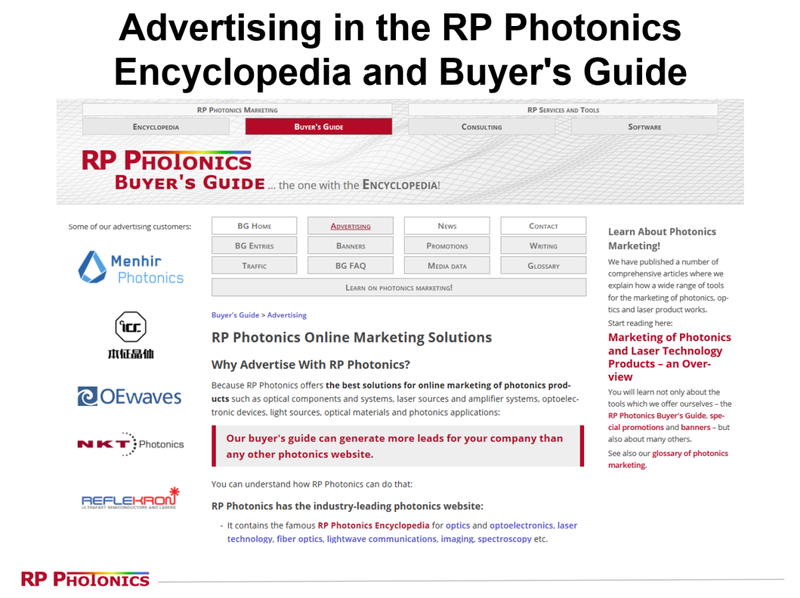 Instead of fluorescence, one may exploit acoustic effects of pulsed laser beams; the resulting method is called optoacoustic or photoacoustic microscopy . 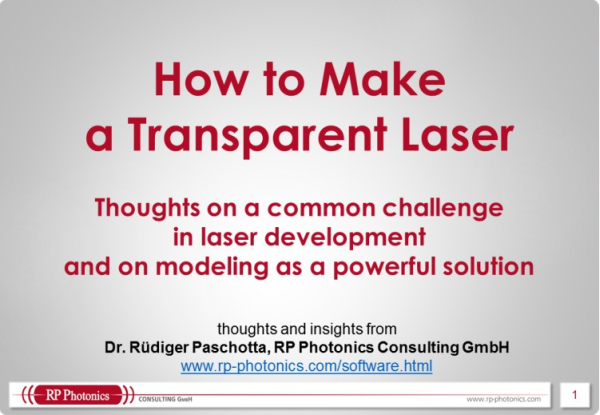 For most variants of laser microscopy, diffraction limits the possible beam waist radius of the scanning laser beam and thus the obtained image resolution. However, some techniques allow to beat the diffraction limit, and are sometimes called super-resolution microscopy or nanoscopy. One class of methods is based on non-uniform illumination in combination with a nonlinear photoresponse. 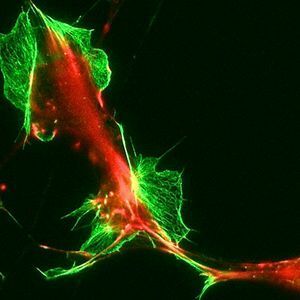 Stimulated emission depletion microscopy (STED microscopy) (explained in the article on fluorescence microscopy, and related to the Nobel Prize in Chemistry 2014) is the most popular method of that type. Other techniques are based on certain fluorescent molecules, which preferably occupy certain parts of the specimen and can be localized very precisely (→ stochastic optical reconstruction microscopy, STORM). Images produced with later microscopes are usually not directly observed through an optical instrument, but on a high-resolution computer screen, for example. That makes it easy to let several people simultaneously view images. Instead of simply displaying recorded intensity values with a gray scale, display software can use false colors. Associated display parameters can be modified at any time when the raw data are kept. It is easy to precisely measure distances and sizes of objects on images displayed on a screen. Software-based image processing can in some respects increase the image quality, e.g. enhance image contrast and remove certain image distortions and artifacts caused by the optics. Software may identify differences between two images, for example taken before and after some manipulations on the sample. Digital images can easily be copied, stored and transmitted over large distances.